I first heard about Tillie’s on the Mouthfulsfood NJ board in early 2016 when one of the members posted a link to a write-up in NJ Monthly. Another member, paryzer, began posting regularly about his many excellent experiences there. So, I’ve had it on my “go to” list for a long time, but we didn’t get around to having dinner there until this past Thursday night. The interior has pleasant décor: dark gray painted wood beneath wainscoting and light gray patterned moiré wallpaper above. There is high hat lighting in most of the room, three small crystal chandeliers at the back, and sconces all around. That lighting is perfect: bright enough to be able to read the menu without a flashlight, but low enough to provide a warm feeling. A long banquette covered in gray fabric is on one side, free-standing tables on the other and in the middle. Given our choice of tables, we opted for the two-top at the far end of the banquette. 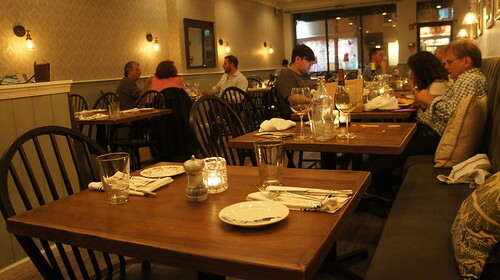 Seven tables including ours were occupied which for midweek in NJ is pretty respectable. Tillie’s is a BYO. Since the menu on the website is a “sample,” there was no way to know exactly what would be on the menu. 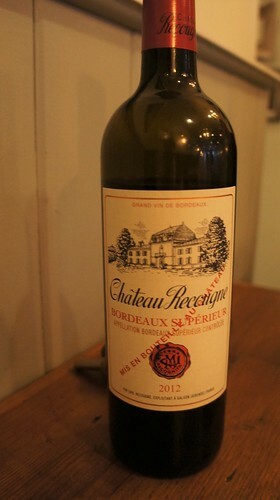 Michael decided to bring a Bordeaux which he felt would go well with beef or chicken, the two things he would be most likely to order. (Unless a restaurant is totally vegetarian or vegan, it’s a good bet that chicken and beef in some form will be on the menu.) Although he had brought a wine glass, it was not needed because Tillie’s provides very good ones. 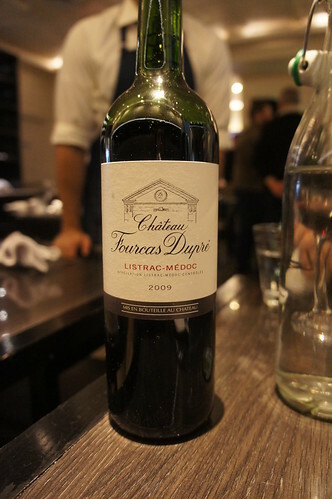 Immediately after being seated, we were given menus by our server Ashley who then expertly opened the wine. She also inquired as to our water preferences. As usual, a large bottle of sparkling for Michael and, although the drinks menu included root beer and ginger beer both of which I like, I decided to stick with Millburn’s finest tap water. 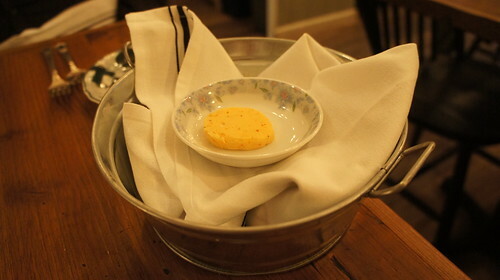 Once our orders were taken, Ashley brought over a tin pail which held a folded napkin with a pat of flavored butter sitting on top. Since our table was opposite the prep station, I had watched her putting the napkin into the pail, cutting up something (I couldn’t tell what), and wrapping it inside the napkin. 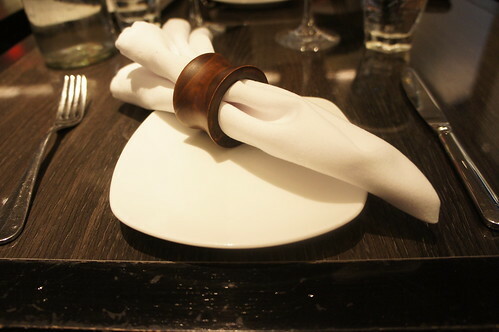 I unfolded the napkin… Ta-da! It was hot (not spicy hot but temperature hot). I tasted it. OMG! 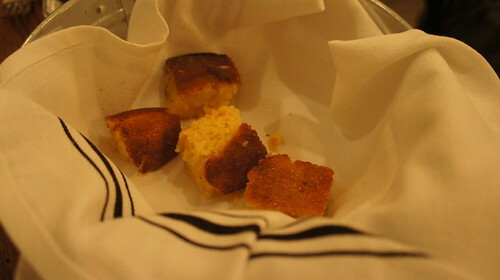 That cornbread was killer! Definitely one of THE best we’ve ever had. There were only four small squares but as the expression goes, thank goodness for small favors because had there been more, I would not have been able to contain myself, and then I would probably have been too full to enjoy the rest of the meal. And that would have been a shame because…. Well, you’ll see why…. Michael said the BLT concept with the classic blue cheese was a winner. Yes, yours truly the Foie Gras Queen is a sucker for liver even it if isn’t foie gras. The very smooth pâté topped with chopped egg was a deconstruction of Jewish-style chopped liver where the liver and hard-boiled eggs are chopped together. 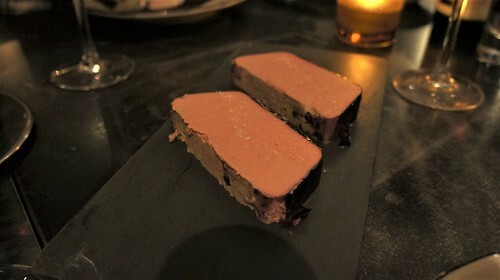 Pâtés are usually accompanied by French brioche and you schmeer the pâté onto the brioche. Here, however, Chef Cook spreads the pâté atop the Jewish challah and tops it with the chopped hard-boiled egg. 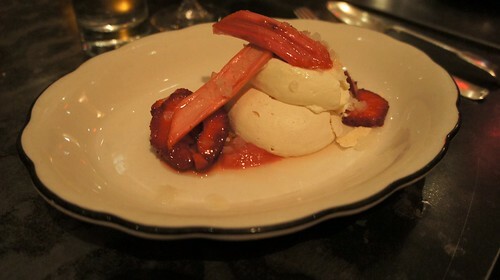 The addition of the saba added a touch of sweetness. My only quibble was that I felt the challah was cut a bit too thick. Cutting them didn’t work well, and when I picked them up, the thickness made it difficult to eat them neatly. Nevertheless, this was a delicious starter. And that included the greens which were lightly dressed with a very tasty dressing. For the main course, Michael chose one of the two steak options. 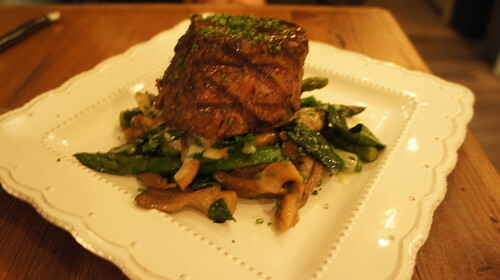 The filet was cooked precisely to his rare specification. 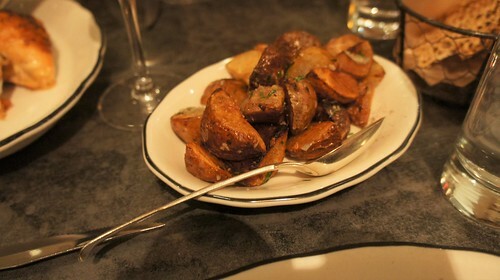 I was a bit surprised that there was no starch, namely a potato in some form which usually comes with steaks. But Michael was very pleased with the green vegetables, and he remarked that the asparagus were grilled to just the proper side of al dente. This is an appropriate spot to mention that he was ecstatic about the Château Recugne which as he anticipated went perfectly with the steak. 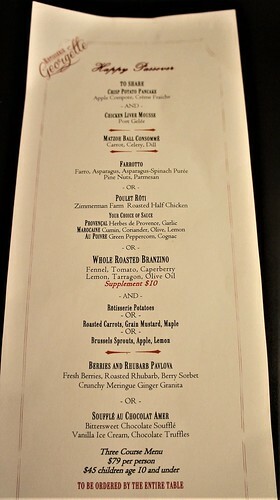 The website sample menu listed duck among the main courses. 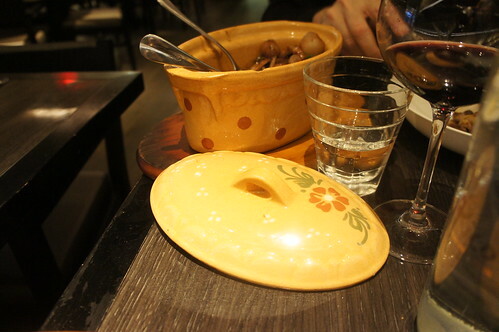 Since I love duck, I had asked paryzer if it was on the current menu, and he had said that it was. Despite the fact that the accompaniments were now entirely different, I ordered it. Honesty impels me to say that I didn’t find the plating particularly appealing. Because one eats first with one’s eyes, I began having doubts about the rightness of my choice. Also, what was on the plate was far more than I would be able to finish, so I decided that if I liked it, I would eat half and take the rest home. 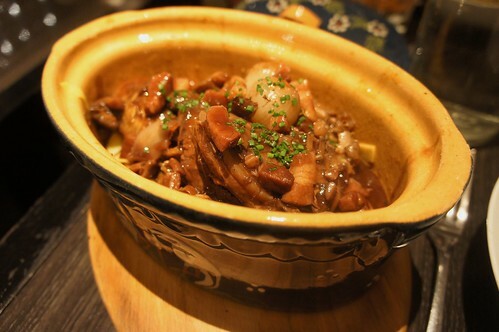 I started by tasting the smaller of the two pieces of duck. Whoa! It was fantastic! Cooked perfectly to my medium request, it was tender, moist, and full-flavored with a nicely crisped skin. Next, I tasted the quinoa mélange. Oh, my! 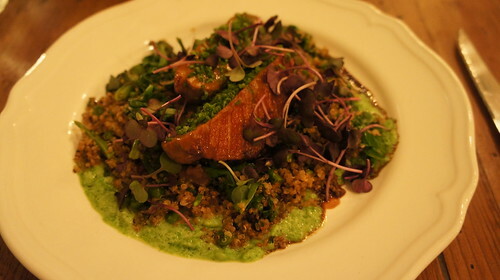 Although I like quinoa, I wasn’t sure if or how it would work with the peas, et al, but it did. There was also a sauce that melded the mixture and added to the terrific flavor. I wish I had inquired what it was. So, sometimes plating can be deceiving because in every way, this duck dish was superb. Have I mentioned that portions at Tillie’s are very generous? Therefore, we both exercised portion control and took home leftovers. I followed through on my original intention to eat only half while Michael ate about a third of the steak and half the veggies. There was no printed dessert menu. Ashley ran through the list verbally, but we actually knew before setting foot inside Tillie’s which one we’d be having. paryzer had rhapsodized about the Key Lime pie, and since it’s one of our favorite desserts, we ordered one slice to share. The very generous slice (Have I mentioned the generous portions at Tillie’s?) 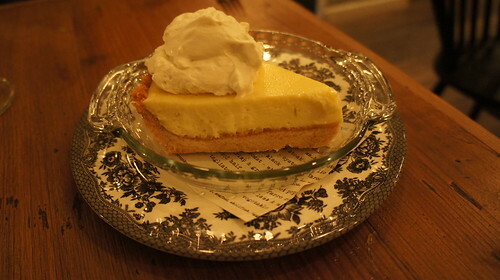 was easily enough to share and lived up to paryzer’s raves: an excellent crust with a lemon filling that was Goldilocks perfect: not too tart, not too sweet, but just right! Tillie’s is not on any social media (I guess they feel word-of-mouth is working for them). It’s also not on OpenTable or any other reservations service which means booking is done the old-fashioned way with a phone call. That’s all fine with me. However, my single major complaint is that, as I mentioned above, the website (the one modern accommodation to today’s dining out world) has a sample menu instead of a current one; thus, it’s missing what I feel is important information one looks for on a restaurant’s site. They really need to rectify that. 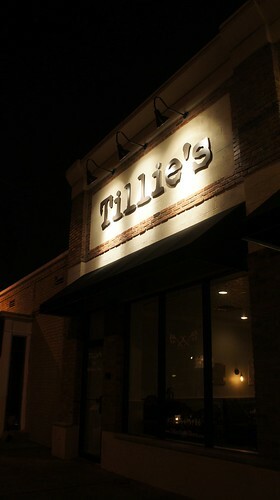 Nevertheless, if you’re looking for a restaurant that has pleasing atmospherics, provides spot on service, and most importantly will tickle your taste buds with delicious food, Tillie’s is that place. We’ll be back! To view the entire photo set of this dinner at Tillie’s, click here. Hard to believe I’m wearing a tank top, shorts, and sandals. 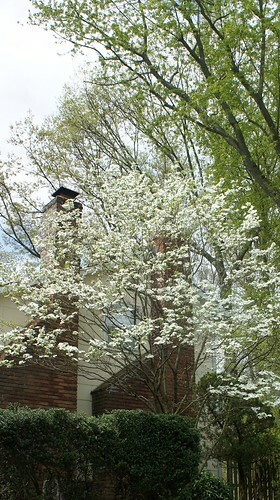 90 degrees on April 28th is 25-30 degrees above normal! A week or so before Passover, Michael received an email from Rotisserie Georgette about the special dishes they were offering for Passover. Owner Georgette Farkas, who previously spent many years as head of P.R. 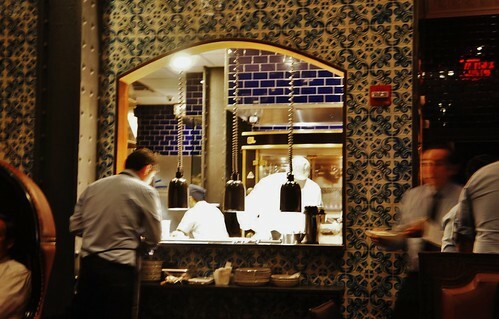 for Chef Daniel Boulud, opened this French-style rotisserie in 2014. We went for the first time in June 2014 and a few times after. Jen and Louis have also been there a couple of times – once with us – and liked it as well. The food is delicious, service is professional, and the space is beautiful. 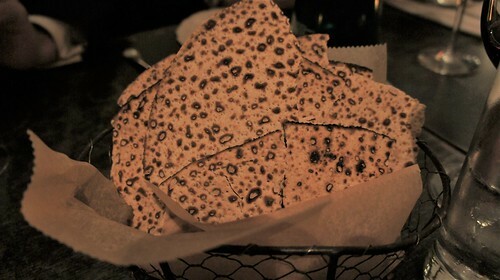 Even though it seemed they weren’t serving a complete Passover dinner, the dishes they were offering sounded great. When I told Jen about the email, she and Louis agreed that Georgette would be a fine choice for the second night’s Passover dinner. We asked Louis’s sister Lesley and her husband Philip if they wanted to join us. They said they would like to. However, Lesley is taking Italian lessons on Tuesday evenings in preparation for their trip to Italy in June. Since the second night of Passover was a Tuesday, she had to see if she could take a make-up class on another day. Happily, she was able to. So, we were a party of 6. Michael and I were the first to arrive. As I said, in the email there had only been mention of a few Passover dishes. However, when we were given the menus, I was pleased to see that, while those dishes were available a la carte, they were also included in a complete Passover dinner. The only catch: it must be ordered by the entire table. After everyone else arrived, it took only a brief discussion for all to agree that the complete Passover dinner was the way to go. 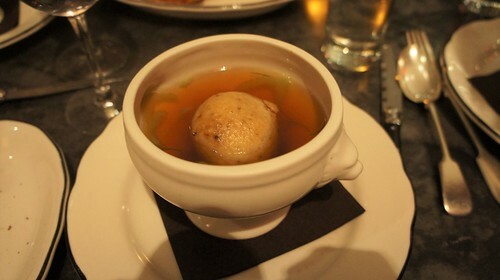 Louis was able to participate because it was almost entirely gluten-free with just two no-nos, matzoh and the mazoh ball in the soup. 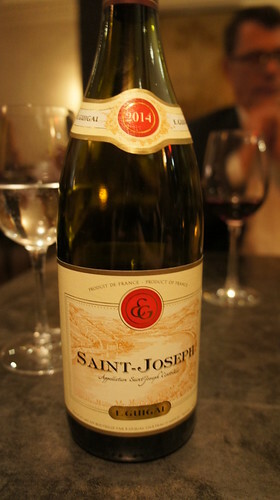 A bottle of Saint-Joseph was chosen which sufficed for the four wine drinkers (Louis and I were the teatotalers). Orders were taken for the main course and vegetable accompaniments. Dessert orders were taken after the main course. Now, you’re probably thinking there must be some mistake. Aren’t potato latkes for Chanukah? How do they belong on a Passover menu? Well, here’s the thing. During Passover, because grains are being verboten for Ashkenazi Jews, potatoes are a biggie! So, why not serve latkes? 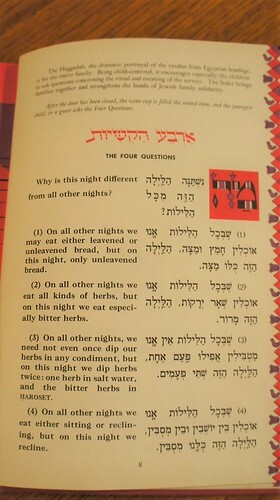 I mentioned at the table that when we used to do the second Seder every year at my Uncle Arthur and Aunt Symie’s apartment (that now seems like a long time ago because it is! 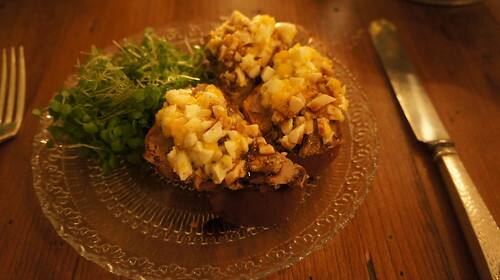 ), she always made potato kugel. Think of kugel as a “cousin” of potato latkes. 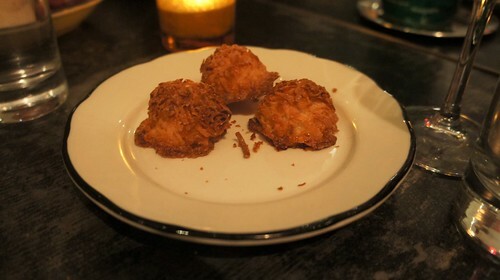 The kugel’s ingredients are the same but baked as a casserole instead fried as latkes. There were six latkes – three on the plate on my end of the table and three on the other end. 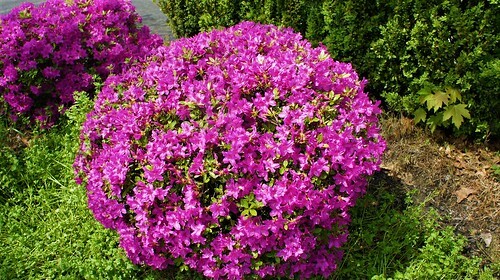 They were extremely crisp around the edges but softer in the center. 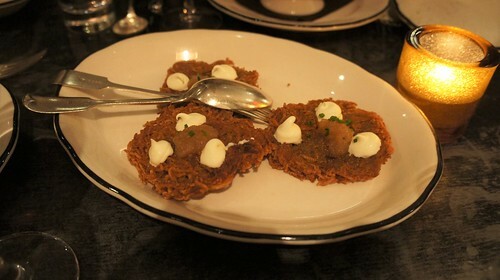 Applesauce and sour cream are standard accompaniments to latkes. Topping them with apple compote and crème fraïche elevated them above the usual, the latter adding French flair. Not unexpected since as I mentioned above, Georgette is a French-style rotisserie. The mousse was definitely in the French mode. And we couldn’t ask for a better “substitute” for traditional Jewish chopped liver than this superb terrine. Smooth as the proverbial silk with lovely liver-y flavor, it worked great as a schmeer on the matzoh. From the three options, everyone chose the chicken. Not surprising since Rotisserie Georgette is known for its chicken. It’s an especially flavor-filled bird, and preparing it on the rotisserie makes it really juicy. 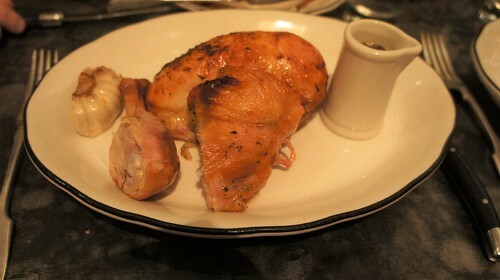 As you can see from my plate, we each received half a chicken. Michael and I picked Provençal. I don’t remember what the others chose. Each main course came with a choice of one side. 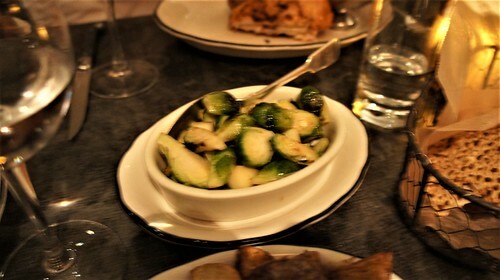 Michael, Louis, and I ordered the potatoes; Lesley and Philip picked the Brussels Sprouts; and Jen got the carrots. Thus, we ended up with all three options. All the veggies were tasty. Portions were generous, so we shared. There were two choices. 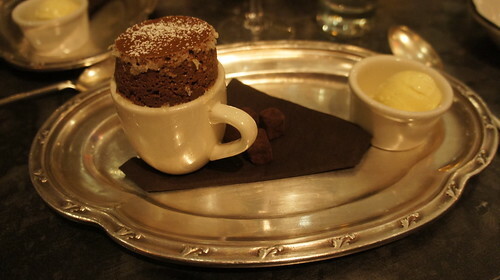 Everyone except Jen chose the soufflé. 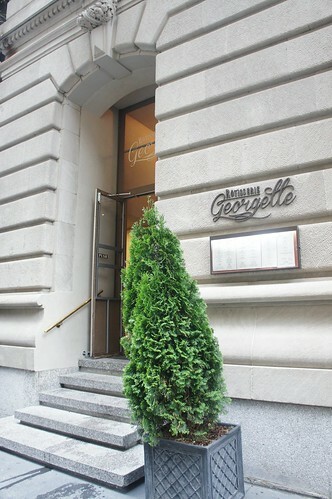 It’s a staple on Georgette’s menu and always perfection! Since I didn’t taste the Pavlova, I take Jen at her word that it was great. I would have much preferred French macarons but, of course, macaroons are standard for Passover. For me, these were the only disappointment in what was in every other respect a truly excellent meal served by an efficient staff from a kitchen putting out the food in a timely manner. Georgette herself was in the house which was the case each previous time we dined there. Not surprising since this is her “baby.” She is sweet and a charming hostess. On our way out, when we told her how much we enjoyed this Passover dinner, she thanked us for coming. If she offers it next year, we’ll definitely considering doing it again. The entire set for this Passover dinner can be viewed on my Flickr here. To see sets of our previous dinners at Rotisserie Georgette click here, here, and here. Passover begins this evening. We will not be doing any Seders, “Express”* or otherwise. Instead, we’ll be having Passover dinners at two different restaurants tonight and tomorrow. So, stay tuned to find out where we went and how they were. Meanwhile, here’s a link to one of my most popular Passover-related posts: Cheese Pie with My Egg Kichel Crust. Wishing all who are celebrating a “zeisen Pesach“! 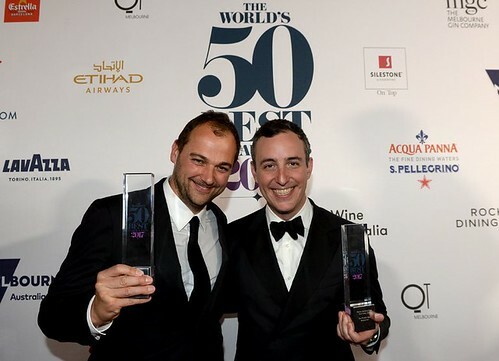 Congratulations to Our Eleven Madison Park Family on Being Number One on The World’s 50 Best Restaurants List! You did it! From last year’s third spot, you skipped over number two and went directly to the top! It reminds us of how you went from one Michelin star directly to three, something few if any restaurants have ever done. Nice habit! We are beyond elated that you’ve achieved this pinnacle of world-wide recognition capping a long string of very well deserved accolades. As Will said in accepting this award, it is an affirmation of the hard work you all do every day to make dining at Eleven Madison Park a glorious and extraordinary experience. To us, you always have been and always will be Number One! Now, the restaurant world agrees. You are THE BEST! We have finally arrived at the last meal of this dining extravaganza. 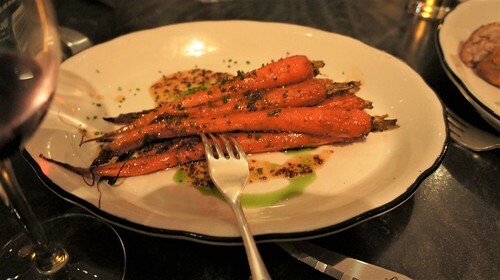 Le Coq Rico opened last year on March 10th, a restaurant whose arrival we’d been eagerly anticipating. Luckily, we were in the city when it opened so wasting no time had our first dinner there on March 11th. 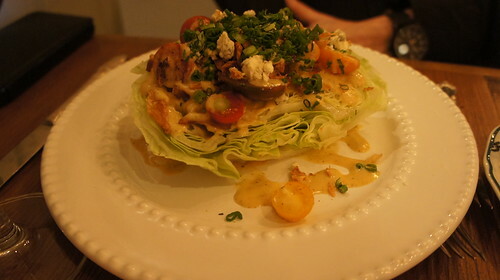 The superb cuisine, excellent service, pleasant ambiance, and warm hospitality immediately won us over. 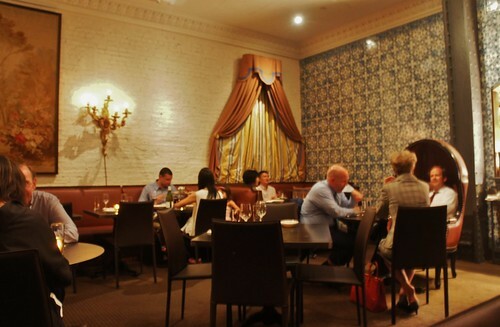 Given its location a short walk from our apartment, it quickly became one of our favorite neighborhood dining spots. During the past year, we’ve had a total of ten lunches and dinners there. We’ve done a pretty good job of eating our way through the menu: all the whole birds; many other mains including the baeckeoffe, the stuffed chicken, and the squab pie; soups, salads, terrines, and sides; and, of course, desserts. All expertly prepared and, as I said, delicious. So, it being a place we always enjoy and where we’ve become “friends of the house” are certainly good reasons for us to have picked Le Coq Rico for of the extravaganza’s finale. However, we actually chose it for a more specific reason. While the same menu is served at both lunch and dinner – a giant plus in our book! – each day during lunch, there is a different plat du jour. It it’s Tuesday, it’s Coq au Vin. Now, this is a dish that Michael adores. Not that I don’t like it, I do. But he really loves it! And if it’s on the menu, he definitely will order it. As it turned out, the final day of the extravaganza fell on a Tuesday. Since it’s rare for us to be in the city for lunch on a Tuesday, this was the perfect opportunity to check out the coq au vin. 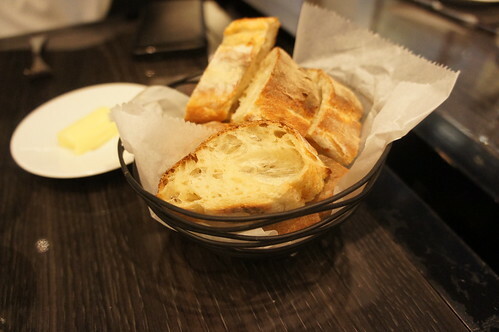 As soon as we were seated, a staff member promptly arrived as always with bread and butter. Michael requested a glass of the wine he most likes to have there. 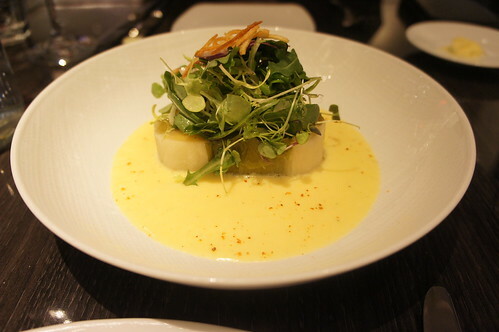 We began by sharing Steamed Leek with Hollandaise. 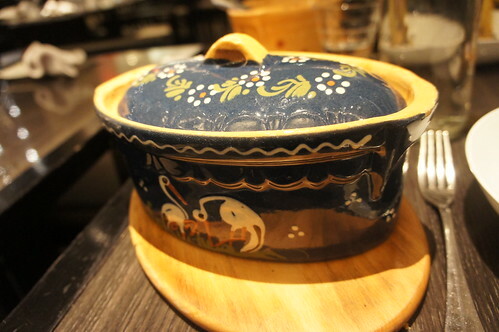 Then, we each ordered the Coq au Vin which arrived in pretty cocottes each with a different design. 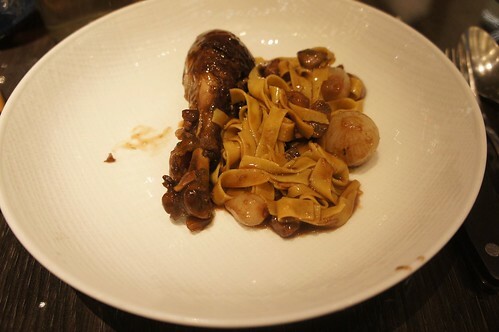 The cocottes held lots of chicken and a gargantuan portion of pasta. In retrospect, we could easily have shared one order since there was no way either of us could come close to finishing one on our own. But looking on the very bright side, plenty of delicious leftovers to take home! 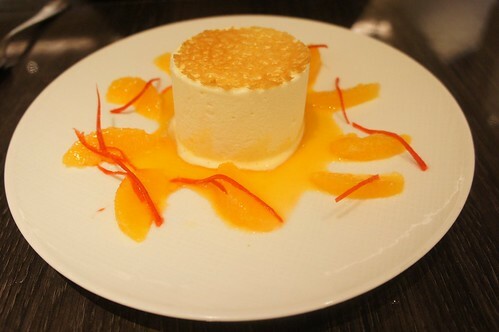 For dessert, Michael chose Mousse Glasée à l’Orange with Orange Salad. 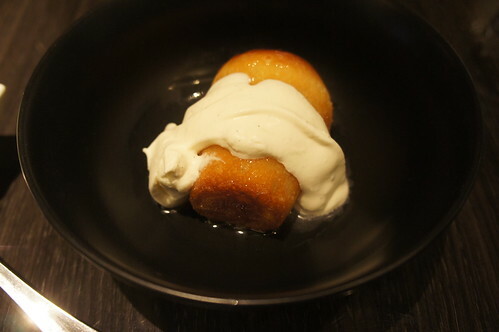 I had Baba au Rhum. A perfect meal to end a truly memorable 5-day birthday dining extravaganza!